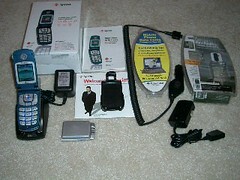 Before the Treo 650 and Bluetooth DUN, my data phone solution required lots of cables. Before the Treo 650 my data phone solution required lots of cables. Since 1993 I have been connecting laptops to mobile phones for "wireless data" and even used the AT&T EO with its telnet client and internal Oki 900 mobile phone. Telnet on a tablet was a real chore with 9600 bps connections. Remember the "someday you can fax on the beach?" commercials? I faxed from the beach. The Sidekick and Treo 600 were the first smart phones that you could really use data on without going insane and I replaced both of these in my pockets with a Treo 650. Since many of us in America have not used Bluetooth for dial up networking I put a little how-to together for Make to get you over the tricky parts. This solution also works for GSM phones pending that you get the correct dial-up number and login information from your carrier. Before the 650, I used this setup with the very rare CDMA Sony Ericsson T608 which had the worst firmware (SLOW and buggy) that I have ever seen on a phone. Enjoy the story. Let me know if you want a Mac version too. It's a little easier and almost self explanitory from the PC. Go figure eh? Follow more at the link.